Ann Lislegaard’s monographic publication Spiral Book, contains a unique overview of her research and artistic work, as well as key influential texts. 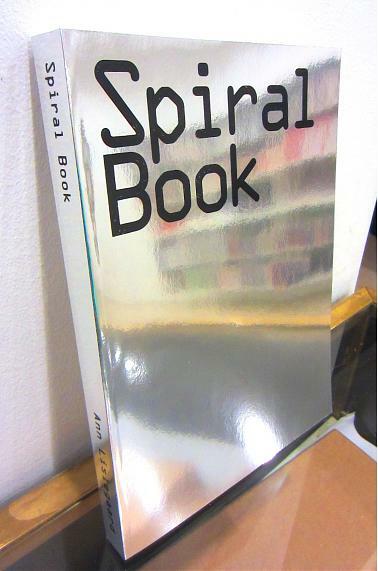 Spiral Book is a survey of Lislegaard’s work. It is an inventory or special kind of catalogue raisonne, one that doesn’t look back but comes to life by mixing images and scrambling origins, and allows for influences to echo across the pages. It is as if the method of prevention suggested by the title hasn’t prevented the various sources that meet in the book to get into bed with one another and engender unexpected new liaisons and vistas into culture at large. Spiral Book is a text machine that breeds hybrids and bastards. Ann Lislegaard was born in Norway 1962, she currently lives and works in Copenhagen and New York. Lislegaard represented Denmark at the Venice Biennale and the Biennial for Contemporary Art, Göteborg in 2005, The Sao Paolo Biennale 2006, Busan Biennale 2010, Sharjah Biennale, 2003, Biennal of Moving Images, Geneva 2001, The Istanbul Biennale 1997. She will participate in the Lyon Biennale and The Montreal Biennale 2013. Recent exhibitions include solo shows at Murray Guy Gallery New York, Paul Andriesse Gallery, Amsterdam, Museum Of Contemporary Art Detroit, The Henry Gallery Seattle, Marabouparken Kunsthall Stockholm, Astrup Fearnley Museum of Modern Art, Statens Museum for Kunst, Moderna Museet Project. Group exhibitions include Museum Of Contemporary Art San Diego, Louisiana Museum of Modern Art, MIT List Visual Arts Center, Boston, Museum Of Contemporary Art Los Angeles, MOMA Oxford, Musee d’Art Moderne de la Ville de Paris. Ann Lislegaard is the professor of the School of New Media at the Royal Danish Academy of Fine Arts in Copenhagen (2004-2013). This entry was posted	on Tuesday, February 12th, 2013 at 3:37 pm	and is filed under events, Motto Charlottenborg event. You can follow any responses to this entry through the RSS 2.0 feed.